First time I have been in since the change and I have to say I am impressed. The Aspels was good and the place has a good chilled out atmosphere. Only had time for a quick pint but will certainly be back. Crikey, the changes to this pub have evidently polarised opinions! I'm very much in the Fussy Drinker camp. 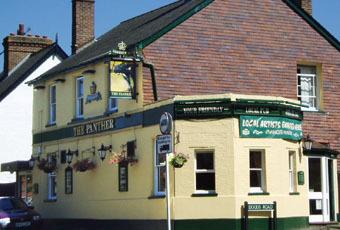 I was brought up very close to the old Panther and used to frequent this occasionally as the then landlord turned a blind eye to us being underage. As soon as I was old enough to get into other pubs, I avoided it. I returned to Reigate last year after a 20 year absence and tried the Panther to see if it had improved, and it hadn't. As before, 95% male clientele, primarly clique-y regulars who were not at all friendly or welcoming. American Werewolf job. What a great change. Nice airy environment, better garden and good range of beers and wines, and clever, well-priced platter menus and attached deli giving you the option to buy to take home the bits on the menu that you liked. I've been there a number of times and the cleintele is mixed and interesting. Oh dear . Tempest is right . Greene King dont let trivial things like the views of their customers get in the way of a new daft idea . Another sell off for housing ? This used to be such a warm friendly pub. Since it changed its name to the Roe Deer it's cold and unwelcoming and not very friendly at all. They do not seem to care about the regulars who drink there and are more concerned about how much money they can make! A few simple things like puting 'reserved' signs on the tables would be helpful. No, not a very good pub at all - they need to have a rethink.